The formal handover of control of the Iraqi armed forces by the American-led coalition has been delayed again. The handover ceremony was due to take place on Saturday but was postponed for a day and will now not take place until later this week. The Americans said the delay was the result of "a miscommunication". The handover should mark another step in Iraq resuming control of its own affairs after the US-led invasion but it seems to be hard to organise. When it was first scheduled on Saturday, the Iraqi Prime Minister Nouri Maliki went out of town instead to visit Iraq's senior Shia leader Ayatollah Ali al-Sistani. The handover, which should happen later this week, means that for the first time since the fall of Saddam Hussein, Iraqi forces will be under direct command and control of their own ministry of defence. But the American-led international forces in Iraq will still take the lead role in many combat operations and still directly control most of the country. There are now around 140,000 trained soldiers and armed police in Iraq but they lack the equipment they need and have often turned away from a fight. Kidnap gangs are able to operate openly in Baghdad and the police are forced to turn away. 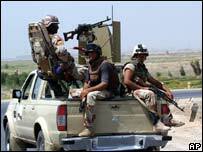 The weakness of Iraqi forces was revealed in a two-day battle in the town of Diwaniya last week. The Iraqi forces took heavy casualties and had to call in American support before arranging a truce with Shia fighters from the Mehdi army.